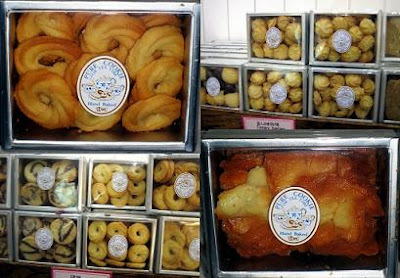 Kat's 9 Lives: Wien : Korean Bakeries Everywhere! There was a Korean Bakery at every corner. My pal really likes Wien, so we went after dinner. It was really close to the Korean BBQ place. I must complain about the small parking space, you are better off parking on the street. We went a little late, so a lot of the baked goods were all gone! So sad! I decided to get two boxes of their mini-cookies. They looked so nice and cute that I couldn't resist. The Almond Tuilles were light, crisp, buttery, and sweet. You can eat the whole box in a few minutes and not feel weighed down, but you will probably be wanting more. The other box was the Butter Cookies that was delightfully buttery and melts in your mouth. It's not too sweet and would go great with milk or tea. My friend got the Corn Bread and Sweet Potatoe Bread. They were both very good. Their corn bread was very light in flavor and not too sweet. The sweet potatoe filling was very flavorful and sweet that complimented the bread. All in all it was good, but a little overpriced. There were a lot of different cakes that were nicely decorated and had an interesting concept. I think I would go back to try more of their cakes and cookies. Overall it's a good bakery, but not anything that I can't live without or would normally crave. Still, if you are in Korea Town why not stop by and try the place out for yourself.